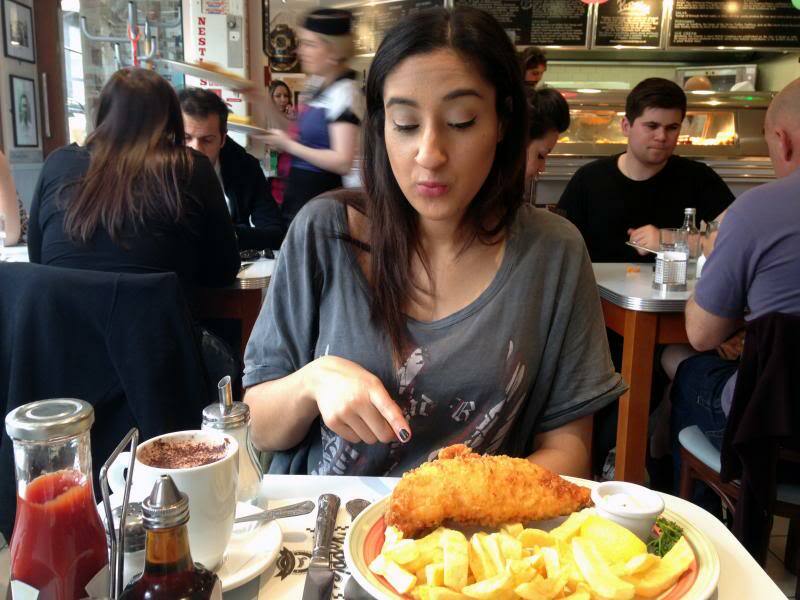 So, here’s a bit of a break from Burgers(sorrynotsorry) – Poppies of Spitalfields is British personified: Fish and Chips. I had heard a couple of people mention Poppies and when Nadia and I found ourselves on the streets of Shoreditch and hungry (not homeless!) we decided to head to Poppies. 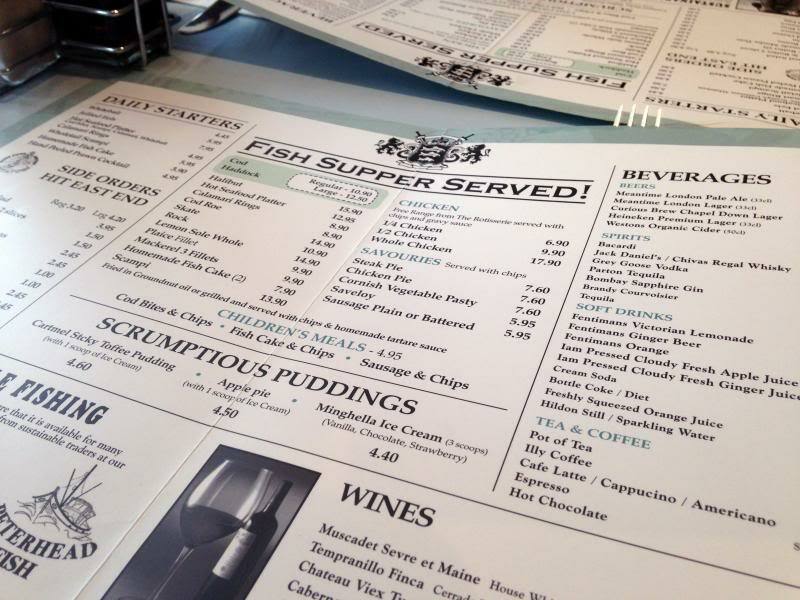 The menu is clear with some nice design detailing however I wish it was 100% consistent – see the lines above and below the titles ‘daily starters’ and ‘fish supper served’ but not on the ‘scrumptious puddings’, ‘beverages’ or ‘wines’ – who would have wine with Fish and Chips though!? 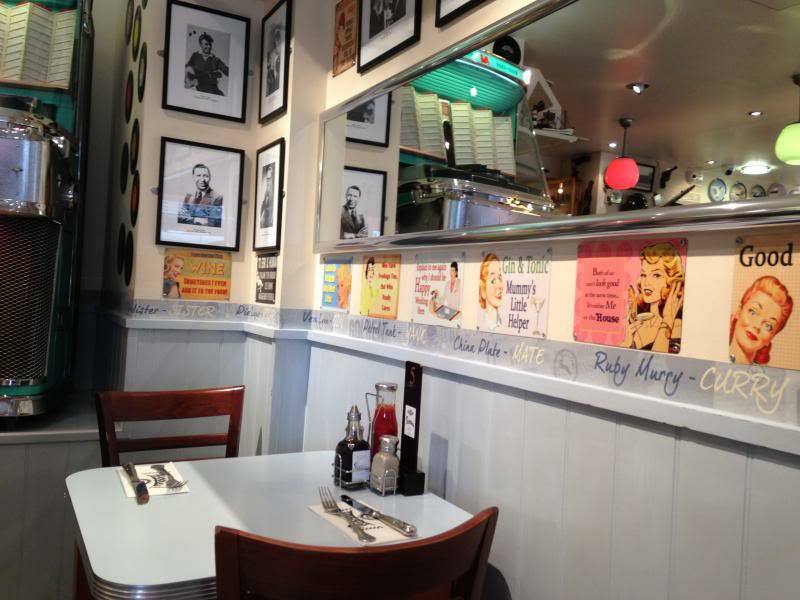 If you’re lucky you get to sit next to the retro juke box which was a gorgeous colour considering it’s age! 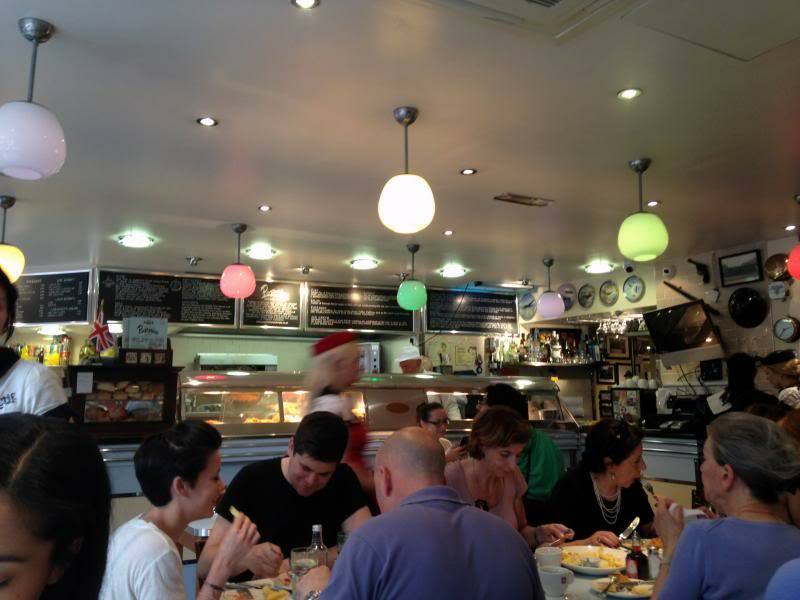 Cutlery ready – I was SO hungry at this point! 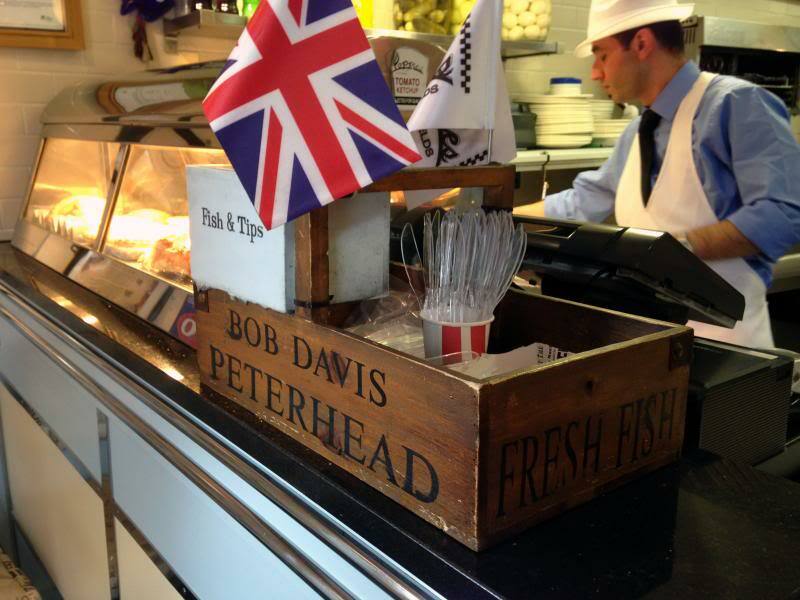 And what a lovely meal it was – the chips were chunky, the fish was cooked to perfection and there was even a slice of lemon to squeeze over it. It was a big portion too, so good value for money in my opinion. The waitress brought the bill over in this cute mini frying net with some penny chew sweets (we only ate the fruit salads!) which was lovely. 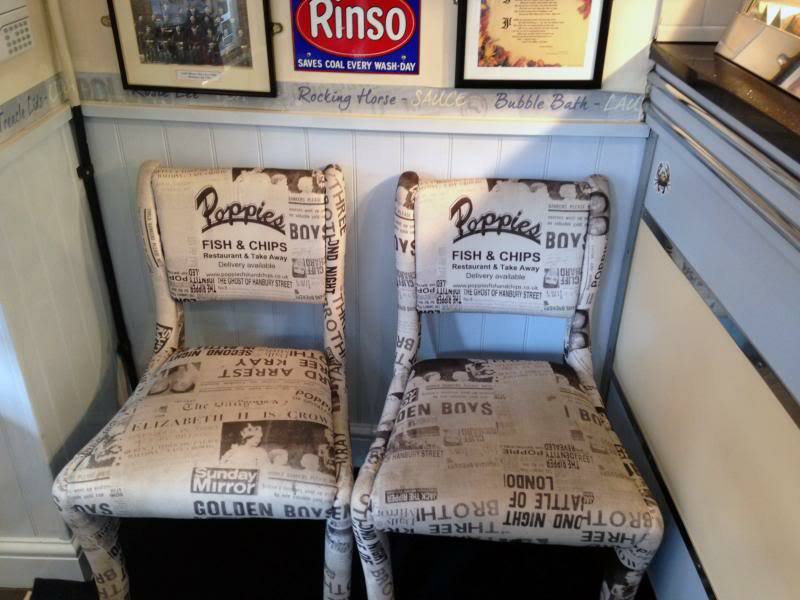 Fish & Tips – I love a good pun! 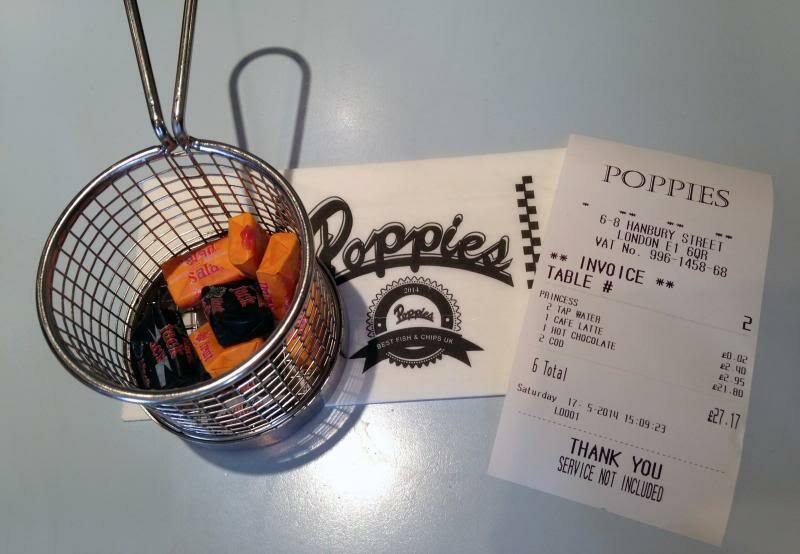 We had a lovely time at Poppies and would definitely recommend it – it was lovely. 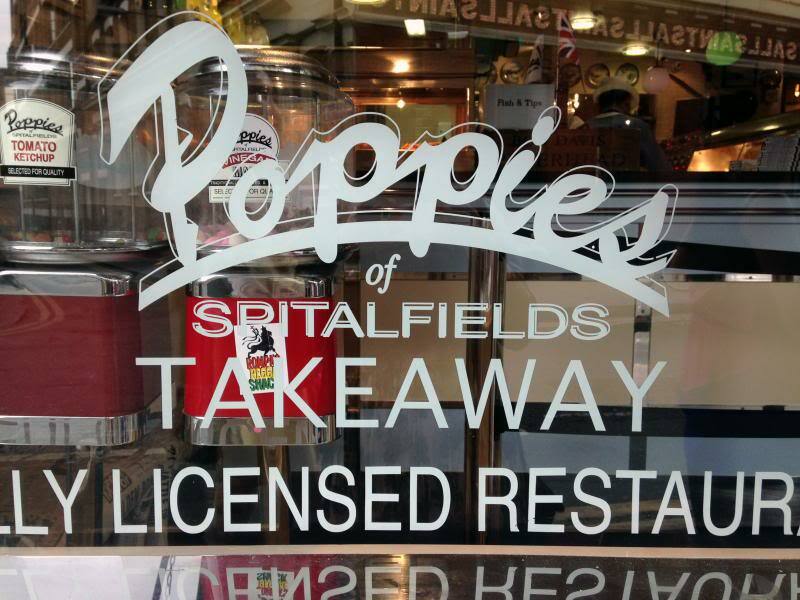 If you’re visiting and don’t have time to eat in the restaurant you’re able to takeaway so there’s no excuse for you not to try Poppies. I saw on their website that they have live music at the Camden restaurant from time to time so check for a fish ‘n’ gigs date soon. 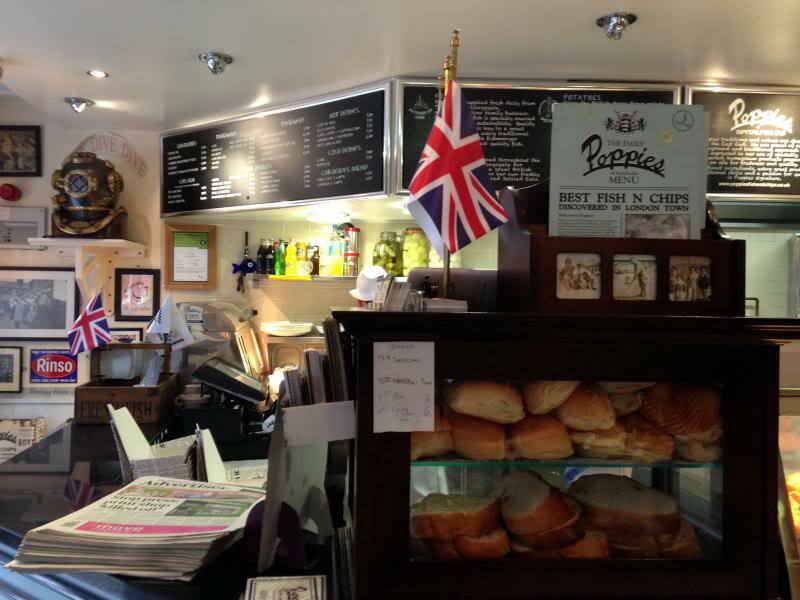 Have you been to Poppies before? What did you think? I’d love to hear about your experiences so let me know. Any recommendations for my next Food & Fonts post? 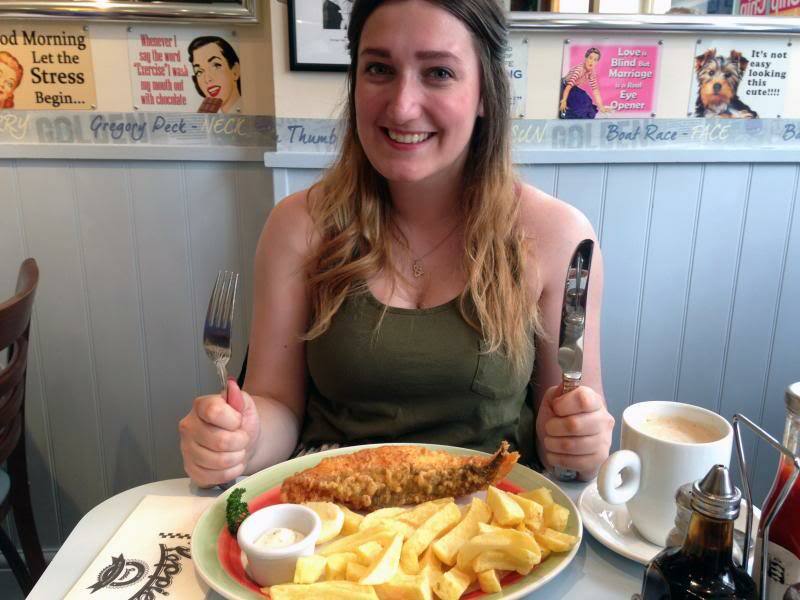 It was so yummy Lauren – you should stop by when you’re next in London! Oooh what’s the best takeaway in the UK? It looks absolutely beautiful! We have nothing as quirky or interesting where I live and I love big cities for this kind of thing. And now I’m starving, so thanks haha. 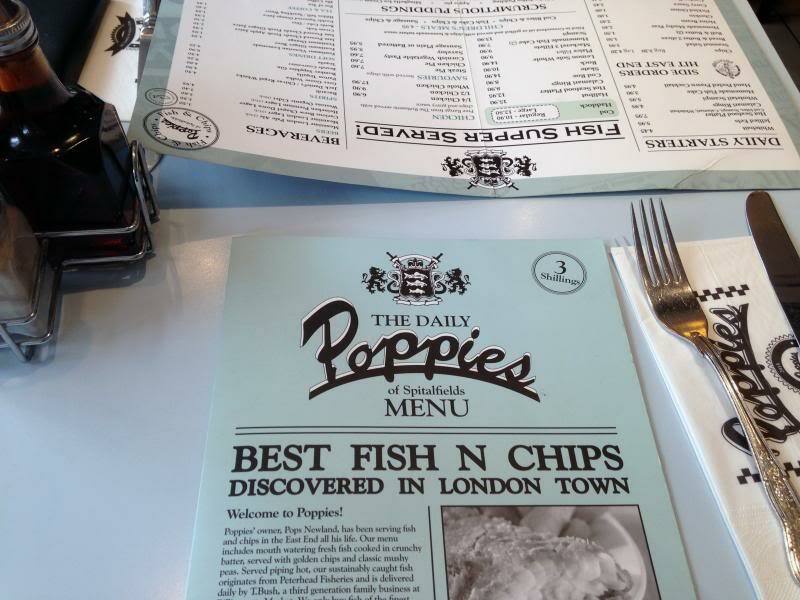 I loved Poppies when I went – I think it’s become crazy-popular since then so it’s nice to see they haven’t scrimped on quality. 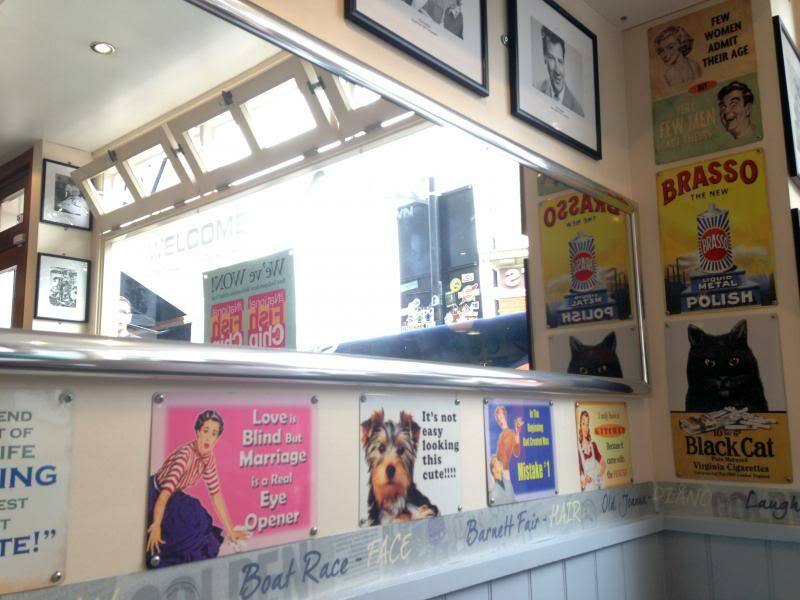 This is a pretty neat way to review a restaurant, I’m always appreciative on good design when it comes to menus and signage – shame about the lack of consistency, something found so often but so easily fixed.